Social Media Metrics and KPIs. Without some kind of measurement, you will never be able to accurately assess how effective a campaign is. And just like all the other processes in your business, social media marketing benefits from having KPIs to measure and drive performance. But what are social media KPIs, and how can you apply them to your campaigns? Social media allows you to collect stats on almost any facet of social interaction. But just because you can, doesn’t mean you should. In terms of your social media marketing efforts, this means identifying social media metrics that actually matter and which can be applied in line with a wider business strategy. Still more important, it means identifying the data you need to measure as degrees of success as you work towards those business goals. Which social media KPIs matter? Does the particular social media KPI actually help you make informed decisions to improve business outcomes? If you are collecting metrics that don’t answer questions, you’re wasting time and resources. Take the (un)humble follower count for instance. Your corporate Twitter account may have hundreds of thousands of followers which looks great in reports to senior management, but what does that value actually achieve? These people may follow your feed and never interact further with your brand. Far more useful are those metrics which show your followers doing something – asking questions, clicking links, re-sharing updates – the sort of actions that help get your brand noticed and spread your message. For the social media marketing team, the KPIs which really matter are those that can be applied to improve campaigns present and future. For the rest of the business, the KPIs that matter will be those that generate cash through new efficiencies or increased sales. Engagement – how many people did something with one of your updates. Post reach – how many people saw your posts? Of particular interest will be the number of people outside your existing community. Conversions – the most important metric of all, which tells you how many leads your campaigns have created. Just remember that you will need the assistance of other managers to properly understand the role of social media in wider business strategy, and the KPIs that really matter. Which social media KPIs don’t matter? Here at Falcon.io, we like to call KPIs that don’t contribute to your broader business goals “vanity metrics.” These are stats that, on paper, can make it look as though your campaigns are hugely successful, but, in truth, only send signals about a facet of the overall picture. So your Facebook page has 100,000 followers – impressive! But do any of them ever make a purchase? And how many of them are real people, and how many are bots? How do you capture the best social media metrics? All of the major social platforms – Facebook, Instagram, YouTube, Twitter etc – come with native tools for business users that allow them to view common metrics. And these tools are perfectly adequate for campaigns on a single platform. But the reality is that most businesses are using an average of between five and nine social platforms, greatly increasing the complexity of measuring and combining metrics. And if you are trying to use nine different tools to generate meaningful KPI data, the task of creating coherent, standardized observations is painfully complex. 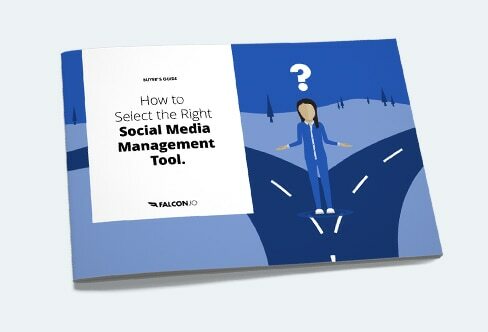 The answer is to use a social media management platform like Falcon that allows you to define KPIs for each social platform, and then automatically collect and aggregate those metrics. The centralized approach also ensures that changing social media metrics to meet new business strategies is a lot simpler.